Whether you're a beginner, recreational or professional poker player, playing at the right site is important. Ask everyone in Australia who's played online poker before and you'll be surprised just how many people have had bad experiences when it comes to the virtual felt. But, with the work we do at PokerSites.com.au, we can find the best sites and have you playing on them in no time. If this seems too good to be true, keep reading and you'll soon realise how we can improve your online poker experience. At PokerSites.com.au we understand how important it is for each and every one of you to find the best and most suitable poker site for you. So, that's why we put the ground work in and you finish it off by winning money at the tables, which seems like a good deal, right? You name a poker site and we've reviewed, ranked and compared it with every other one in the market to provide you with the best places to play online. This way, you save an abundance of time not having to research it yourself and post in forums asking whether or not the site is safe and offers good games. We provide the sites and you can thank us later when you've experienced the best online gaming experience. 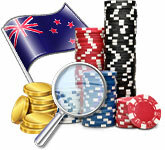 After all, if Aussies weren't playing online poker and looking for sites to play on, where would we be? We're all in this together and providing you with the most up to date, in-depth information of every online poker site is the least we can do. This is the most important part of what we do at PokerSites.com.au and always takes place before we recommend these sites to you. Whether its information on deposit and withdrawal timeframes, which hours are the best for cash games or how easy it is to multi-table on the software of that site, we test everything for you. The last thing we want to happen is for us to recommend a poker site and you come back to us with a number of issues that you've had whilst playing there. As you know, not all poker sites have different variations of Poker and just have the typical NL Holdem games running. But, for those of you who have a different taste and like to play the less familiar games, we can the perfect sites for you. From Omaha and Stud to Razz and 2-7 Triple Draw, we will test the games and provide the best sites that have those tables filling up fast, ready for you to start making sweet Aussie dollars. The deciding factor on whether or not you want to sign-up to a site is the sign-up deals, bonuses and exclusive deals that those sites provide. Majority of sites will offer a sign-up bonus of 100% or more, which is what we want to find for you, but making sure the offers are legitimate is vitally important. All you need to do is read our reviews, see where the best bonuses are and get playing at the tables on that site, for free cash! Depositing funds works in cohesion with sign-up offers as only real money games apply, therefore we make sure we recommend sites that accept Australian deposit methods such as: VISA, Mastercard, Skrill and POLI. To help boost your bankroll, taking advantage of a sign-up offer is vital, so take a look at the sites we've reviewed and make the best choice for you. After all, the decision completely comes down to you when choosing where to play online Poker and which site suits your needs. But, there are huge advantages to using our website when looking for a reputable site. The best part of it is, we are all hugely experienced and knowledgeable when it comes to online poker and know exactly what to look for in a great site. Our reviews are totally unbiased and provide accurate information on what each site offers to poker players of all experience and skill levels. With all this information available at the click of a button, it wants to be accessed and doing so will definitely result in you enjoying a great gaming experience.